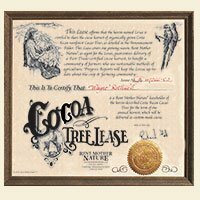 Give someone cocoa from their own Fair Trade cocoa tree. This is one of the greatest gifts. The cocoa is the best I have ever tasted. A perfect experience! Wonderful! Thank you for getting this out to me so quickly. I’m thrilled to have discovered Rent Mother Nature and will be purchasing more in the future, and I also just posted a shout out to you on my Facebook page, “TeachingGreen”.